Discussion in 'Guitars in General' started by TGwaH, Jan 22, 2012. 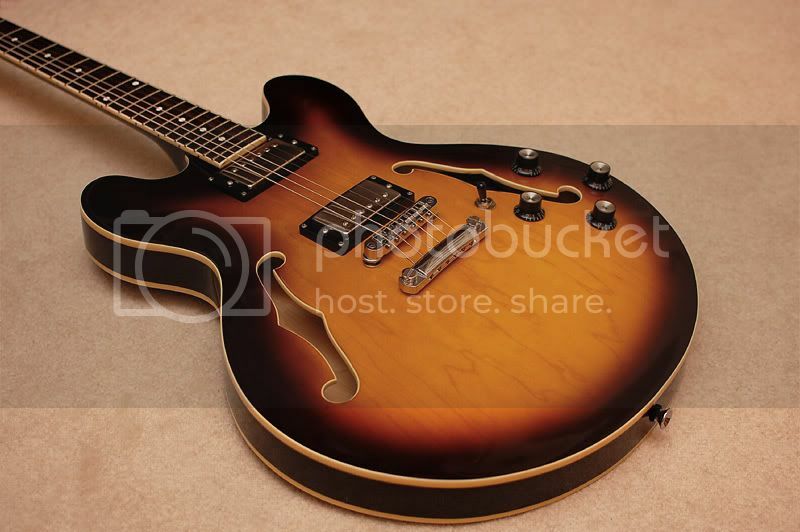 About a year ago I thought had finally settled on a Sheraton II to satiate 335 lust. However, it was not meant to be. The first electric guitar I ever remember seeing was Michael J Fox playing his anachronistic ES-335 in Back to the Future when I was 4. Though in retrospect, it may have been a 345. Regardless, as much as I wanted this Sheraton to do it for me it's not a 335. Furthermore, it's too. . . fancy for lack of a better word. The block inlays, the neck binding, the gold hardware, none of that ever did it for me. To that end, I'm looking at getting a nice second hand 335. This is the first guitar I'm spendig over 1K on and am researchng obsessively. I've a rough idea, but man prices are all over the place. You should be able to pick up a nice Heritage 535 for 1500-1600. If you look in the emporium, I've seen two nice 335 types today....an Edwards for 1100 and a Gibson for 1500. Approximately. I picked up a used Heritge 535 four $1k here on the emporium a few years ago. Best $1k I've ever spent. If you're patient, you could probably score one for $1200. Don't forget about the ES-333. I, too, was searching for an ES335 on the "cheap." This is what I bought. My Hamer was $400 used with HSC and another $100 for a pair of used Seth Lovers. if you're REALLY wanting a 335, just get one. save up and buy one. it sounds like that's the only thing that'll do it for you. don't screw around. we've all done this. wanted a guitar and spent $$ and time trying to sidestep the actual guitar. just get it over with and you'll sleep better at night. trust me. the 335 neck, though, is rather slim. make sure you play one first. Thanks for all the responses everyone. These prices are fairly inline with what I was thinking. I've played a couple 335s and the neck is one of the reasons I was never able to bond with the Sheraton... the neck on that is like a basebal bat! I love my Epi Dot 335. It's a good one. Ooh, I want a $100 pair of Seth Lovers!